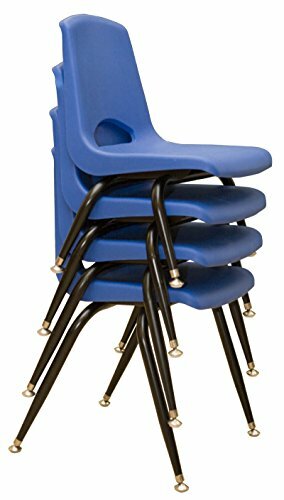 This set of 6 blue chairs are made with colorful and durable one-piece shell of high-density (heavy duty) polypropylene seats with steel legs. The width of the seat is 13 3/4", providing comfort for children and teachers. The plastic seat is supported by steel brackets on the back, making the chair much stronger and long lasting. The steel legs are with black powder-coated finish. All steel legs are installed with nickel-plated swivel glides to prevent scratching floors. The chairs can be stacked by 5 to 10 in one row. It is very easy to clean. If you have any questions about this product by Learningground, contact us by completing and submitting the form below. If you are looking for a specif part number, please include it with your message.